For many people, seeing a cassette player in a car is a throwback to the 'good old days', but for some younger motorists they can be confusing contraptions. A car mechanic in the US has had to deal with one disgruntled young driver who came in complaining that his car's "smartphone holder" had been scratching his iPhone. Of course, it materialised that he had been sticking his phone into the cassette player, completely unaware of what the small slot was actually meant to be used for. As for the mechanic, this was one problem that was pretty straightforward to solve. However, in many cases when customers bring their cars into the garage it can be more difficult to ascertain what the issue is – a road risks insurance policy enable mechanics to drive other people's vehicles so they can detect faults or ensure repair work has been successful. 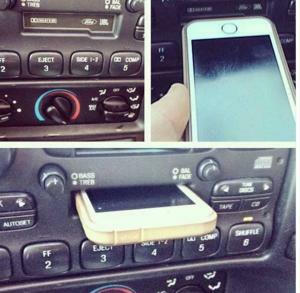 Mike Smith at Buick GMC shared the photo of an iPhone housed inside a cassette player on Facebook, with the image quickly going viral. The image has more than 46,000 likes since being uploaded on 25 August, and many people have been commenting on the ignorance of the youth of today. Teresa Langdon commented: "This is our future leaders? SCARY!" Halinyah Yerry added: "Goes to show, people so don't know their history."